Readers ask for more information on superyacht Air – the largest Feadship offered for rent – so we deliver! In the past, we profiled the launch of motor yacht AIR, which prompted discussion. Superyacht AIR surpassed all expectations during her sea trials and her owner is scheduled to take delivery in just under two weeks. Shortly after, she will depart Holland and head straight to Monte Carlo to undertake her July Mediterranean yacht charter booking commitments. Joining a fleet of the largest yachts for hire, the gigayacht still has open charter dates in the months of August and September. 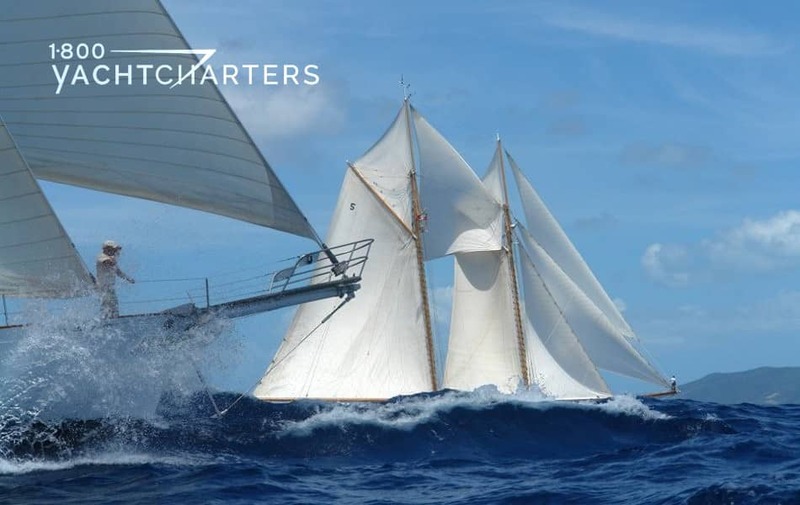 At the conclusion of the summer season, the yacht will re-position across the Atlantic and join the St. Martin yacht charter fleet. Feadship yacht AIR is helmed by co-captains Stephen Warren and Mark Finch and boasts a young and enthusiastic crew, including an excellent young British chef, new to the industry. They are all looking forward to a spectacular season. The yacht features a sleek, elegant exterior with a unique matte black steel hull. The minimalist interior, created by Remi Tessier, is stunning. Amenities include an 8 meter-long pool located on the main deck forward, and a sun deck with full gym and Jacuzzi. Other features include an elevator to all decks, massage and steam rooms, and a fully-certified commercial helicopter pad (helipad). BE THE FIRST to charter this beautiful new yacht this summer. The weekly rental rate is €750,000 plus expenses. Contact our office for photos and additional details at https://www.1800yachtcharters.com/book-now-contact-us/. Helipads on luxury yachts are commonplace. Ondeck helipads no longer turn heads at the quay in Monaco. The type of helicopter on the pad still garners envious gazes, however. 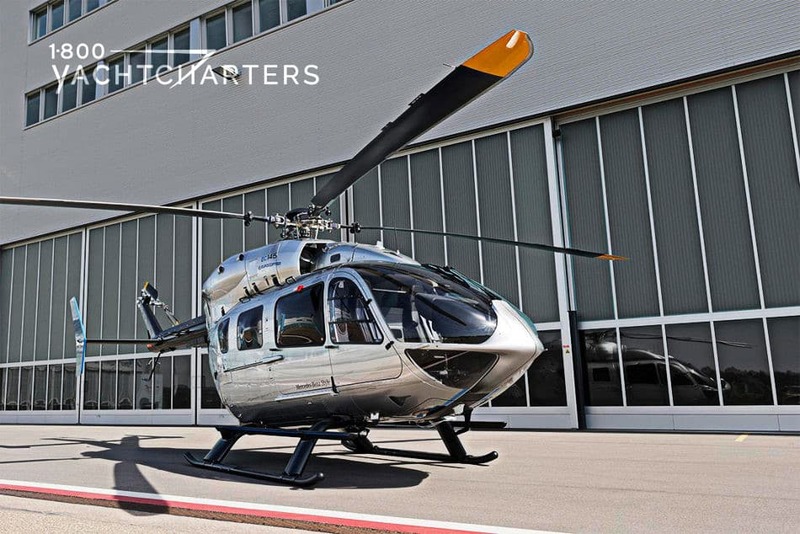 Eurocopter premiered the first finished aircraft at this month’s EBACE 2011. Only one year after unveiling the EC145 Benz concept airship, they did it again. Last year’s European Business Aviation Convention & Exhibition (EBACE) was in Geneva. Mercedes new helicopter is inspired by R-class high-end vehicles. The twin-engine Mercedes Benz-style helicopter features a versatile interior. For instance, it is enabled by a modular approach . This allows it to be tailored to suit a range of travel needs for the well-heeled. For example, taking the family for a weekend getaway in the Alps. Other options might be taking celebrity clients to a St Barts yacht for New Year’s. The EC145 interior showcases Mercedes’ knowledge of luxury materials. It also showcases lighting for both luxury ambiance and German practicality. This magic is created by Mercedes-Benz Advanced Design Studio in Como, Italy. Cockpit and cabin upholstery is available in a range. For instance, the usual top-shelf Benz materials and colors. It is also offered in elegant woods for flooring and ceiling paneling. Ambient lighting is also available in various colors. Mercedes uses this technologies in E and S-Class cars. The EC145 Mercedes-Benz Style aircraft is not just about luxury but the effective and flexible use of space. It is the only he-lo in its class that can seat up to eight passengers. For the cabin layout, all seats are mounted on rails and can be quickly and easily reconfigured/removed for additional room for luggage. There are also multi-function boxes with features such as a mini-frig, cup holder and table, and 15-inch TV monitor and DVD player. The aft-cabin features a high-capacity luggage compartment with room for baggage, golf clubs, even bicycles. Like the R-Class models that inspired it, the Eurocopter EC145 Mercedes-Benz Style is the most versatile and spacious helicopter in its class. Available 2011, this model will surely be onboard Virgin Island yacht charter vessels right away. Rugby World Cup 2011 New Zealand starts this September. In conclusion, contact our destination experts HERE to charter a yacht for this special event. Presenting the brand new classic schooner sail yacht GERMANIA NOVA. As they say, “everything old is new again.” The 47 meter Italian-built yacht is the latest sail-powered superyacht. The Germania NOVA (“new”) design makes this new yacht unusual and spectacular. She is a replica of a classic 1908 yacht named Germania. The original vessel had a storied history before sinking off the coast of Florida in a hurricane. Her builder was Krupp-Germania-Wurft in Kiel, Germany. The company is famous for constructing submarines also known as U-boats. The original Germania sailed a 47 mile course around Britain’s Isle of Wight in record time in 1908. In 1914, the yacht visited Southhampton, England where she was seized as a prize of war. She then changed hands several times. Germania was renamed twice (firstly, Exen, and secondly, Half Moon). Finally, The yacht became a floating restaurant and dance hall in Miami, Florida. She sank near Key Biscayne (a small island near Miami) in 1930. The schooner became the seventh Florida Underwater Archaeological Preserve when it was dedicated in 2000. Germania is now part of the US National Register of Historic Places. Jana Sheeder, President of 1-800 Yacht Charters, proudly shares that her companies (1-800 Yacht Charters and Bareboat.com) donate floating mooring buoys for over the Germania (Half Moon) site. Technological advances and comforts aboard the replica are awe-inspiring. For instance, the sailing yacht features satellite television. She has flat screen panel tvs in the main saloon, master stateroom, and all guest cabins. Cinema-quality 5.1 Dolby surround sound DVD service is available in the main saloon and master stateroom. Guest cabins have radios with CD and MP3 players. iPod connections are present throughout the yacht. She was built for charter and features all amenities desired by guests. The classic GERMANIA NOVA is available in the western Mediterranean. With a crew of 13, her rate is €80,000 per week, plus expenses in July and August. Her rate drops to €70,000 per week, plus expenses, for low season dates. At the end of the season, the yacht will relocate to the Caribbean for the winter. 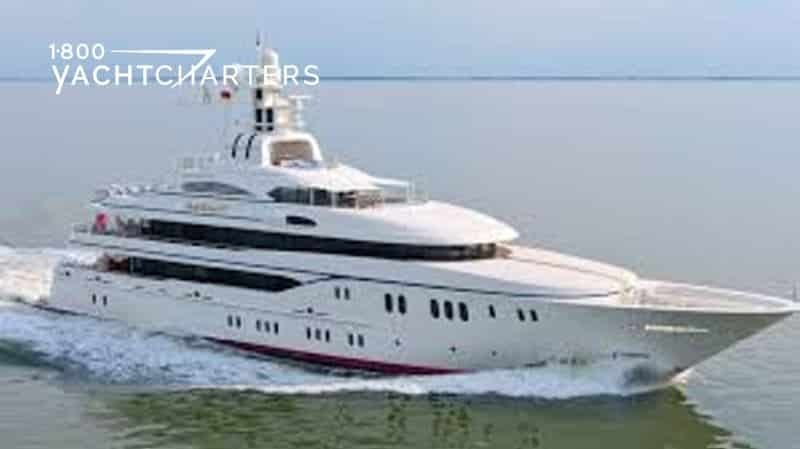 Feadship yacht charter enthusiasts can breath a collective sigh of relief as the newly launched motor yacht TANGO escaped disaster in the Netherlands last week. 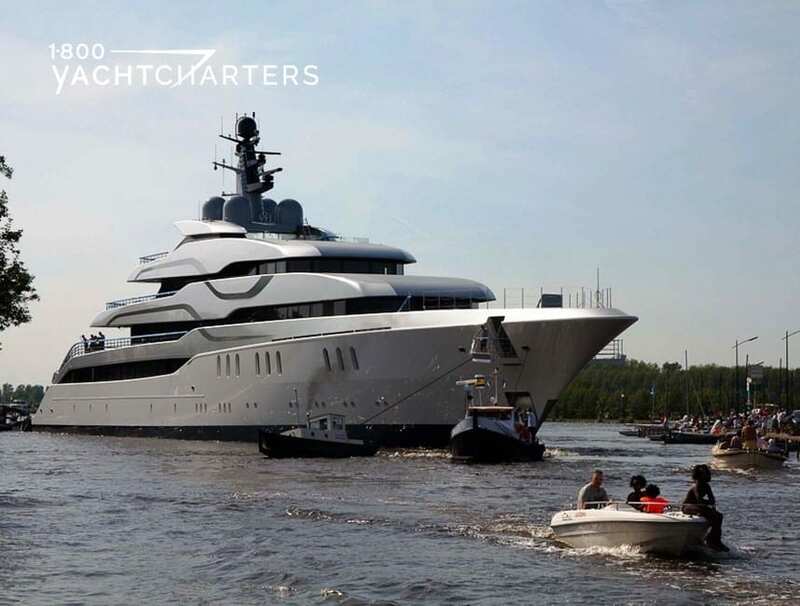 Launched on the 8th of May, 2011, the 77 meter Feadship yacht TANGO was enroute from the yard on Kaag Island to Rotterdam for her sea trials, when the two tugs that were assisting her had to stop and wait for the bridge in Waddinxveen to open. Moments before the superyacht was to pass underneath the bridge, part of the bridge collapsed, and debris rained down into the water from 30 meters above. The vertical bridge was built in 1935 and stands 34 meters in height when drawn fully open. At the tine of the incident, the bridge was operating on emergency power after a power outage hit the city of Waddinxveen. Local authorities say it is unclear why the bridge fell down. Hmmmm….maybe the fact that the bridge is SEVENTY-SIX years old might have something to do with it!!! Enjoy a vacation onboard what one charterer called the “Rolls Royce” of yachts – a Feadship. The newest model open for charter is motor yacht AIR, available this summer in the Mediterranean. Muscovites eager to enjoy a Mediterranean yacht charter vacation rejoiced! They now have two opportunities each week to fly. For instance, direct flights to Spain’s yachting capital – the Balearic islands. S7 Airlines added twice-weekly direct flights between Moscow and Palma de Mallorca. S7 Airlines offers the only scheduled direct service between Palma de Mallorca and Moscow. These flights take just four hours. This proves popular among Russians, because they have an alternative to traditional yacht charters in the Med. 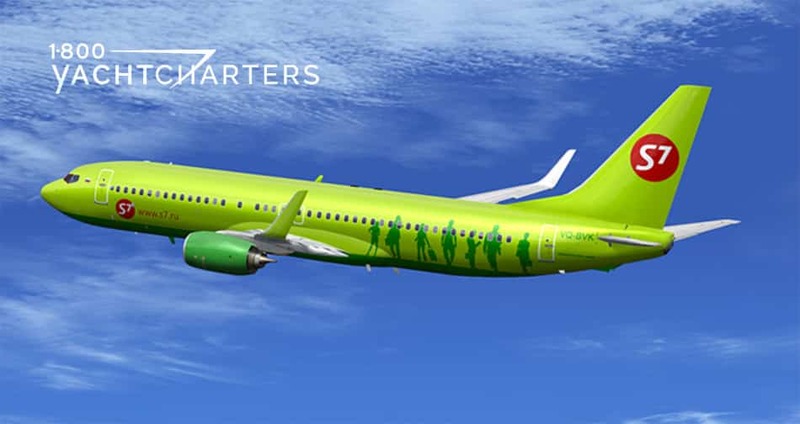 S7 Airlines claims to operate one of the youngest aircraft fleets in the Russian air transportation industry. Additionally, they are a member of the oneworld global aviation alliance. For example, the Moscow-Palma flights can carry 128 passengers and will run twice a week. These fly on Thursdays and Sundays, on Airbus A319 aircraft. Did you know that only commercial yachts with a Spanish license can legally offer crewed charters that begin and end in Spanish waters? In conclusion, for your next yachting holiday, turn to the experts who understand the rules for a safe and memorable vacation. Contact the destination experts at 1-800 Yacht Charters HERE. Internet rumor mill ignored. 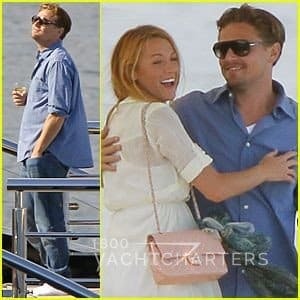 Actress Blake Lively happily spends quality time with new beau, Leonardo DiCaprio. Websites circulated photos showing the “Gossip Girl” actress posing naked. Blake and Leo were unphased. They were seen relaxing and laughing onboard motoryacht SEVEN SEAS. They enjoyed Spielberg’s multi-million dollar superyacht during the Cannes Film Festival. Lively’s spokeswoman issued a statement saying the photos aren’t real. “Blake Lively won’t be happy about this,” while site Zap2It, suggested the pictures were old. Lively will take legal action. She will go against any outlets that publish the photos. Earlier this year, she was hired as the face of Chanel’s Mademoiselle handbag ad campaign. The actress had a chance to take a break from the hustle of the film fest and relax at sea with Leo and his good friend Lukas Haas onboard Steven Spielberg’s 282 foot vessel. 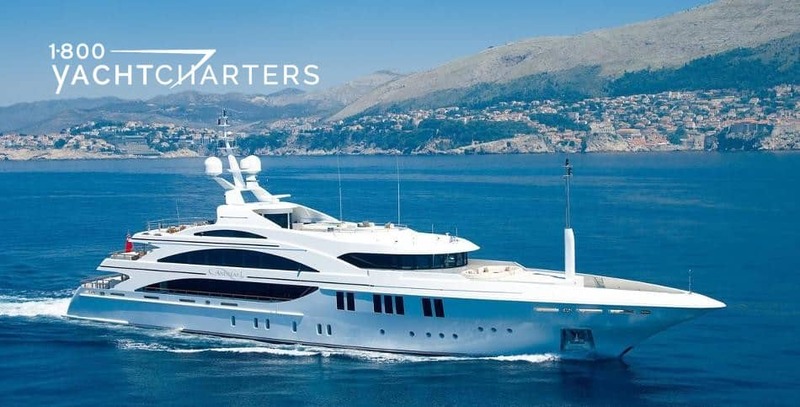 At one point, Lively was seen enjoying a big laugh with Di Caprio before getting a warm hug from the Hollywood leading man.The former Mediterranean yacht charter vessel, motor yacht SEVEN SEAS was originally put into charter after her launch in late 2010. At the time, she was on of the largest yachts available for hire. Since then, her famous owner had a change of heart and decided to keep the yacht for private use only…at least for now. Join your favorite celebrities this winter. Hire a St Barts yacht charter vessel to celebrate New Year’s Eve. Contact us at https://www.1800yachtcharters.com/book-now-contact-us/ to plan your vacation. The latest Lürssen shipyard launch is motor yacht LADY KATHRYN V. She is previously known as Project Coco. This yacht is the fifth in a line of boats of the same name. Motoryacht LADY KATHRYN V succeeds a 164′ Wesport. The yacht is steel with an aluminium superstructure. LADY KATHRYN V is an evolution of the Linda Lou series. That group of yachts began in 2006. 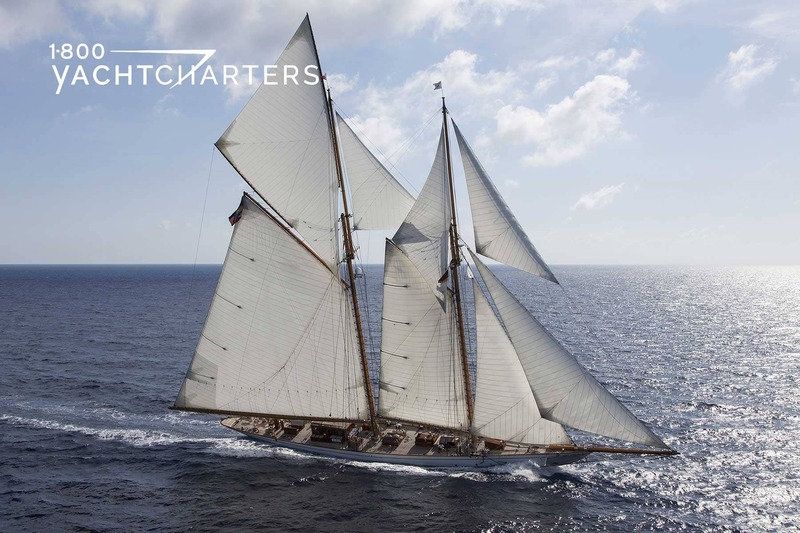 She is 61 meters in overall length. She is slightly longer than her predecessors. There is no full-beam section to this deck. The yacht then has a sleek and classic appearance. She has a unique crow’s nest above the sundeck. The crows nest affords a panoramic view of the sea. The Adam Lay interior accommodates 12 charter guests. The master suite is situated on the main deck. There is a VIP stateroom on the bridge deck, and below that are four double cabins on the lower deck. Other Lurssen yachts include motoryacht KISMET, superyacht SOLEMATES, luxury yacht TV, and power yacht MARTHA ANN. In conclusion, the owner takes delivery this Summer. Lady Kathryn V will then be available for hire in the Mediterranean. After her first winter season, she moves to the Caribbean. Check our yachting vacation discounts and specials for this season’s hottest deals! Contact us at https://www.1800yachtcharters.com/book-now-contact-us/ to book your yacht charter vacation! The final nominees for the 2011 ShowBoats Design Awards have been announced, and a group of mega yacht charter vessels lead the way. 59 finalists were culled from a record 250 nominations for the second annual competition, sponsored by Boat International Media. At stake, is a coveted “Golden Neptune” to be presented at a gala awards evening in Palm Beach, Florida, on October 25, 2011. Anyone planning to rent a private yacht for a luxury, sea-based vacation need look no further than the list of nominees for this year’s program. Leading the way are some of the newest yachts available for hire. Dubois Naval Architects, fresh from running away with a number of honors at the recent World Superyacht Awards is in the spotlight again. Their yachts KOKOMO (finalist – naval architecture; interior layout; interior design) and TWIZZLE (finalist – naval architecture; exterior design and styling; interior design; recreational area for guest use) are early favorites to win again. 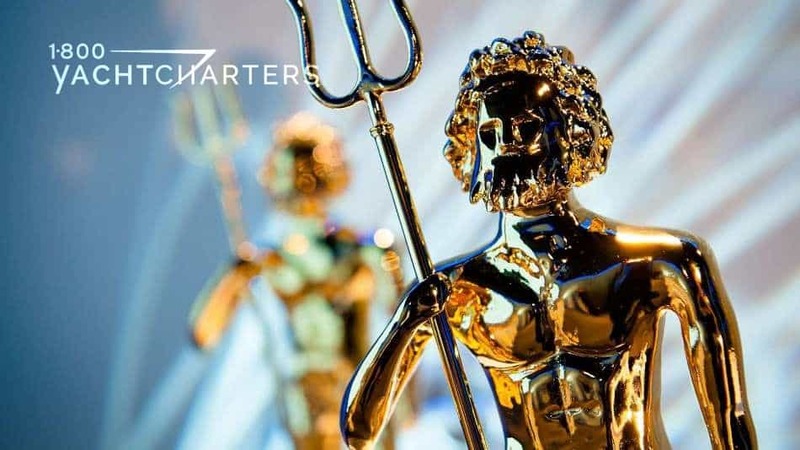 The finalists will be scrutinized by an independent panel of judges, including superyacht owners and renowned designers from outside the yachting industry. The award gala will take place at Mar a Lago Club, Donald Trump’s exclusive private club in Palm Beach. Held on the final day of the Superyacht Design Symposium, the ceremony concludes two days of design-focused events in Florida prior to the Fort Lauderdale International Boat Show (FLIBS). Table of 12 – Early Bird Price: $5670 (savings of $630). Table of 10 – Early Bird Price: $4725 (savings of $525). Contact our Special Events department at https://www.1800yachtcharters.com/book-now-contact-us/ for ticket information. She is amazing, for example, she is one of the largest yachts for hire in the world. Andreas checked into a Spanish shipyard for something similar to Restylane® beauty treatments. Her touch-up cost a half-million Euros. The star of the luxury yacht charter fleet is now ready for the summer charter season. New anti-fouling paint has her looking sharp. It also makes her slide smoothly and efficiently through the Aegean. Captain Mauro (formerly the master onboard the 90 meter motor yacht, Lauren L) is at the helm this season. He brings his extensive local knowledge and experience of the Med to charter. A new Italian chef and a new chief stewardess have been added to the crew. They are filled with energy and ready to welcome charter guests. The yacht was formerly named AMNESIA. The 196 foot Benetti motoryacht ANDREAS L accommodates 12. There are six elegant staterooms within sight. The yacht features top audio-visual entertainment and communications systems. Lucky charter guests are pampered in the massage room and hair salon. Joanne, a full-time masseuse/therapist/stylist, takes great care of guests. A well-equipped gymnasium awaits heath buffs. This special gymnasium has a unique ocean vantage point. Afterwards, sore muscles can then be soothed in the large Jacuzzi tub on the sun deck. The yacht’s watersports inventory includes a SeaDoo Bombardier jet boat, four Polaris waverunners, scuba gear, and towable toys. Towables include Tubesters, Thrashers, and Bananas. Other items, for instance, flyfishing equipment, windsurfers, and waterboards, are included. Oh…we almost forgot. In addition to great watertoys — who could miss the helipad! The perfect easy access, away from watchful eye of the paparazzi! Priced from 315,000 EUROS per week plus all expenses. Click HERE to book your summer escape onboard this amazing yacht. Above all, make any offer! We will submit it to her owner on your behalf. For most of us, the last thing we pack in our duffel bag before a Virgin Islands yacht charter is sunscreen. At this point, we’ve all heard the warnings about skin cancer and the need to lather on the protection. What remains less clear is the amount of protection we need. The confusing jumble of sun protection numbers, symbols, and claims on the sunscreen bottles can be daunting. Soon, simplified labeling standards will help consumers cut through the confusion. 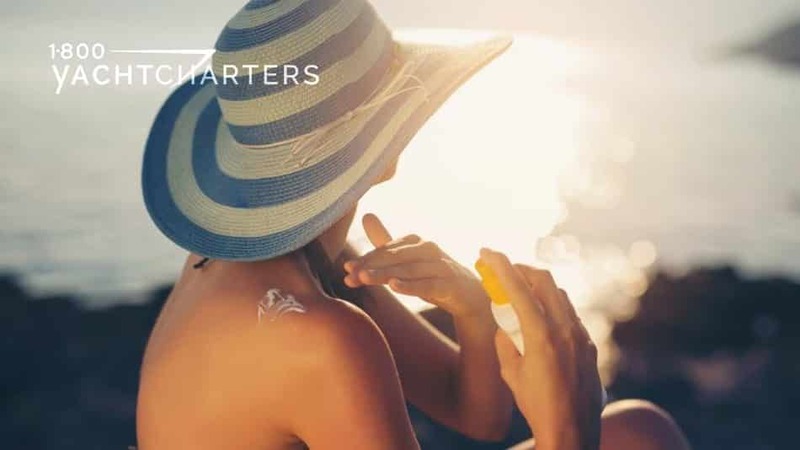 Starting next summer, consumers can look for SPF 15 sunscreens with the words, “broad spectrum” on the label, and feel confident they’re being protected from an increased risk of cancer. Currently, protection standards only to ultraviolet B rays, which cause sunburn. Under the new rules outlined by the Food and Drug Administration, sunscreens will also have to protect against ultraviolet A rays, often associated with skin cancer. The new guidelines are designed to enhance the effectiveness of sunscreens and make them easier to use. Jana Sheeder, President of SailAway Yacht Charter Consultants and 1-800 Yacht Charters, says the clarification is good news. “These changes to sunscreen labels are an important part of helping consumers have the information they need so they can choose the right sun protection for themselves and their families,” said Dr. Janet Woodcock, director of FDA’s drug division. • The FDA seeks to cap the highest SPF value at 50, unless companies can provide results of further testing that support a higher number. • A four-star system currently used by some companies to rate UVA protection must be phased out. The FDA decided the star system was too confusing to consumers. Instead, protection against UVA should be proportional to protection against UVB, which is already measured using SPF. The SPF number indicates the amount of sun exposure necessary to cause sunburn on skin protected by sunscreen, as compared with unprotected skin. For example, an SPF rating of 30 means it would take a person 30 times longer to burn wearing that sunscreen than with no sunscreen at all. According to the National Cancer Institute, last year about 68,00 people in the U.S. were diagnosed with melanoma — the most dangerous form of skin cancer. An estimated 8,700 died from the disease. Almost $2 billion is spent each year treating the disease. When booking your luxury yacht charter vacation, Contact us at https://www.1800yachtcharters.com/book-now-contact-us/ for a COMPLIMENTARY BOTTLE of Neutrogena Spectrum+ Advanced SPF 100+ Sunblock Lotion. Offer good on all yacht charters booked though 1-800 Yacht Charters before December 15, 2011.